Rochester City Hall is located at 320 Main Street, Rochester, IN 46975; phone: 574-223-2510. Photo: John W. Smith House, ca. 1892, 750 North Pontiac Street, Rochester, IN. 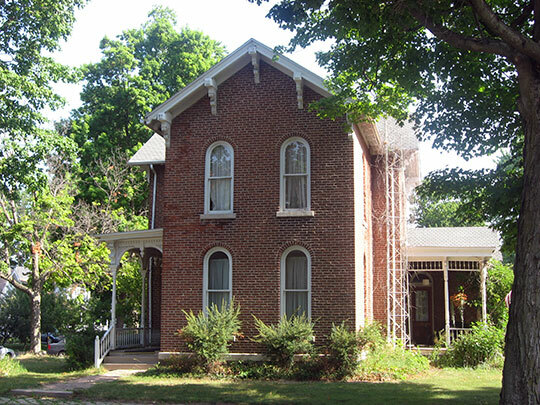 The house is located in the Rochester Westside Local Historic District. Listed on the National Register of Historic Places in 1979. Photographed by User:Nyttend (own work), 2012, [cc0-by-1.0 (creativecommons.org/publicdomain/zero/1.0/deed.en], via Wikimedia Commons, accessed August, 2013. Parts of the Village of Rochester were platted for Alexander Chamberlain and Lot N. Bozarth in 1835 for Cyrus Taber, William G. Ewing and George Ewing in 1836. On June 11, 1853, the county commissioners began consideration of a petition to have the village of Rochester incorporated as a town. At an election July 25th that year the citizens voted 35 to 24 for incorporation. In the election of September 26, 1853, Sidney Keith was made first president of the Board of Town Trustees, and David Pershing was elected first town clerk. Much of the City's early growth was influenced by the railroad. From 1853 to 1882, the Indianapolis, Peru and Chicago, now the Norfolk and Western and the Chicago and Atlantic now the Erie, were built through Rochester. On Monday, October 11, 1909, citizens of the Town of Rochester voted 446 to 213 to reorganize as a city of the fifth class. The first city election was held on December 21, 1909, officials were chosen as follows: Mayor, Omar B. Smith; Clerk, Joseph Bibler; Treasurer, Roy Shanks; Councilmen, Perry M Shore, William P. Ross A.L. Denistion, Dr. J.L. Babcock and William Brinkman. During this period when Rochester became a City, grade schools were erected, the courthouse was built, and the water company and power company were organized. Also, Rochester College was founded, Woodlawn Hospital begun and the Carnegie Public Library was constructed. From 1910 to 1929, the City survived the economic boom and crash following World War I. From 1930 to 1953, the City experienced a surge in growth accompanied by the construction of new industries and businesses. From 1954 to 1969, development spread into the area adjoining Rochester. Two elementary schools were built and the Federal fish hatchery was purchased by the City for park purposes. Rochester Parks and Recreation Department, 2008-2012 Master Plan Draft, www.rochester.in.us, accessed August, 2013.